With the Trump ban on refugees from seven predominantly Muslim countries dominating the news—and rhetoric flying from both sides of the political spectrum—it seems a good time to get some perspective on the global refugee crisis by the numbers. 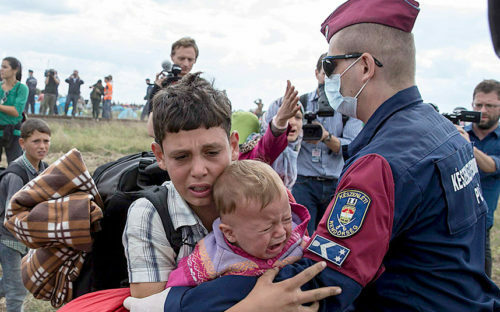 According to the UN Refugee Agency (UNHCR), under international law a refugee is a person who has fled their own country of nationality and cannot return due to fear of persecution because of their race, religion, nationality, membership in a particular social group, or political opinion, and is unable or unwilling to avail themself of the protection of that country, or to return there, for fear of persecution. In 2015 the UNHCR put the total number of global refugees at 21.3 million, half of them under the age of 18. Of those, 107,100 (0.16%) were resettled in 2015. This does not include all of those who have been “forcibly displaced” but do not meet the legal definition of a refugee, which brings the total to 65.3 million. For example, the 4 million people in Syria driven from their homes by war, but still within their home country, are not legally refugees. 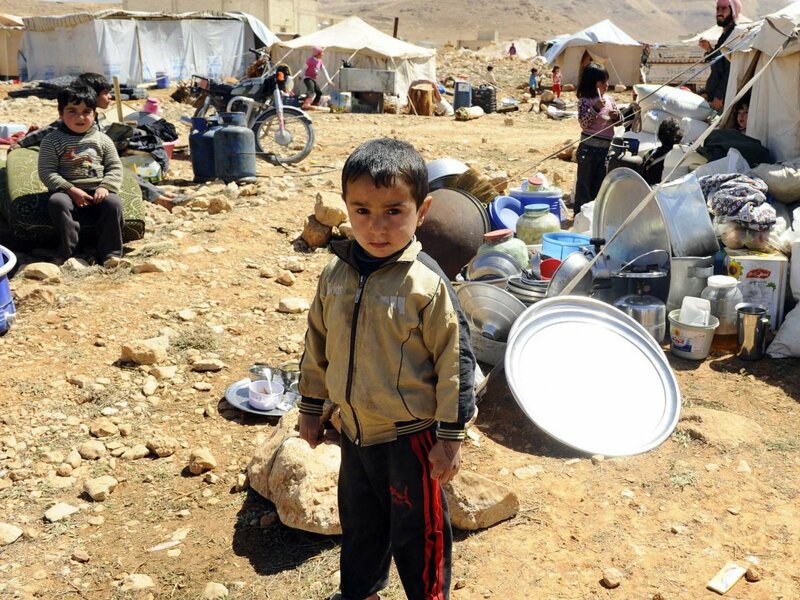 Conflict or persecution forcibly displaces nearly 34,000 people every day. Where are these refugees coming from? 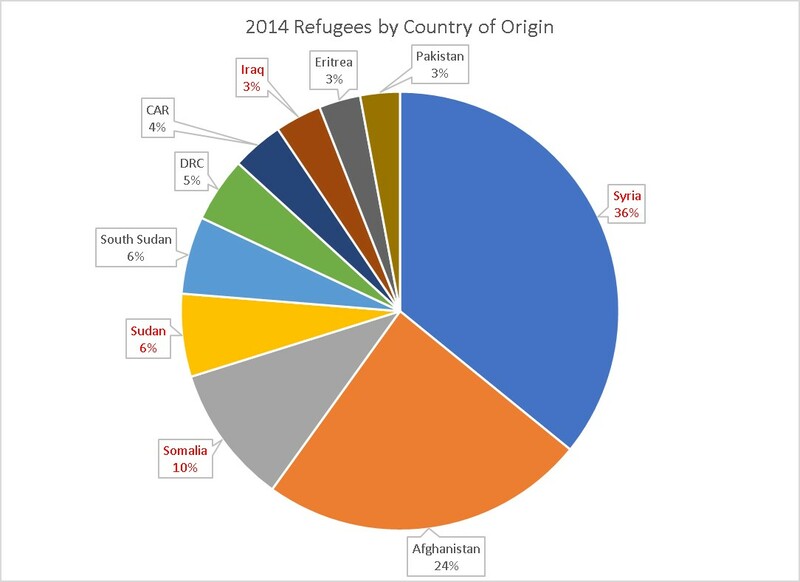 Three countries of origin currently make up 53% of global refugees: 4.9m from Syria (banned), 2.7m from Afghanistan, and 1.1m from Somalia (banned). Where do all these people go? 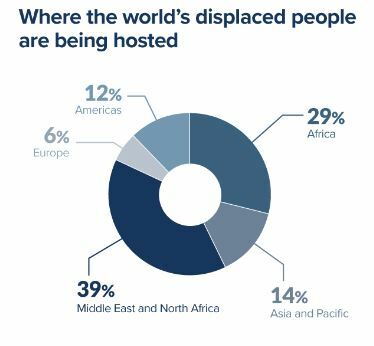 Looking at the 65.3 million forcibly displaced, the UNHCR shows 39% in the Middle East and North Africa, and another 29% in Africa. Focusing only on the 21.3 million refugees, the top country accepting refugees is Turkey with a total of 1.8 million by mid-2015, followed by Pakistan at 1.5m, then Lebanon at 1.1 m. The United State is 16th on the list at 267,222 and Canada is 26th with 149,163. While the raw number of refugees shows a disturbing story—are Pakistan and Lebanon really able to host 2.6 million refugees between them—the picture is even more telling when seen as the number of refugees per 1000 of the host country’s population. Lebanon tops the list with 208.91 refugees per 1000 citizens. Put another way, just over 1 in 5 of the people living in Lebanon are refugees. Jordan has 89.5 per 1000, Nauru just over 50 per 1000 (Nauru is a poor south Pacific island country that gets aid from the Australian Government in exchange for hosting the Nauru refugee detention centre). 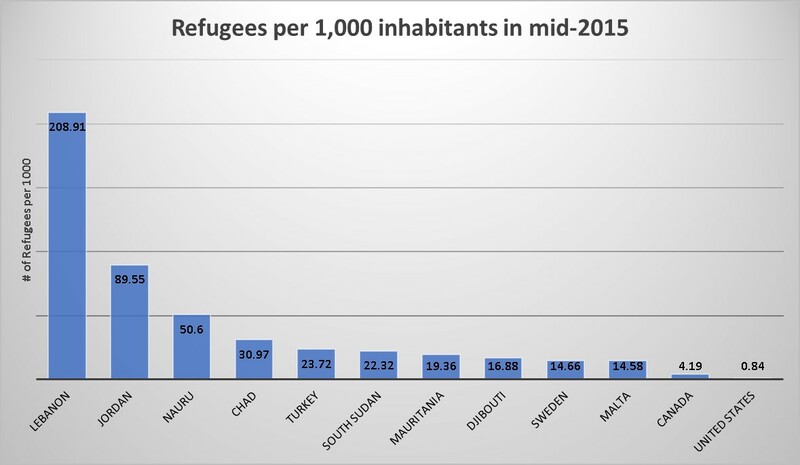 The only European country in the top ten is Sweden, 9th on the list, with 14.66 refugees per 1000 citizens. Canada is 41st on the list with 4.19 refugees per 1000 citizens, below Libya, Panama and Niger, and just above France. Germany is 46th with 3.1 per 1000 (remember these stats are mid-2015, before Germany took in over 1m refugees). 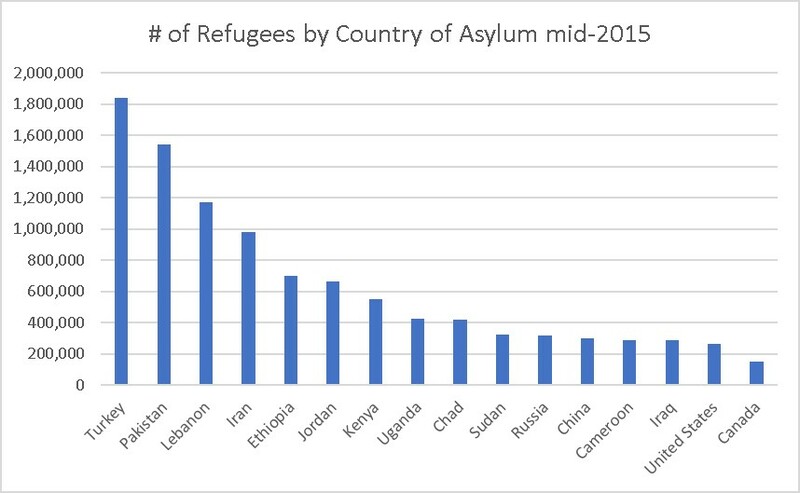 The United States is 75th on the list, just below Senegal, Botswana and Mali, with 0.84 refugees per 1000 citizens. ← Corrupt or incompetent—Why is government so bad?